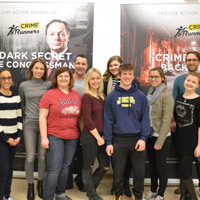 A group of Webster Vienna students in the WebsterLEADS leadership program spent an afternoon of team building and problem solving at Crime Runners, a "room escape experience" in Vienna co-founded by Webster alumnus Stefan Tauchhammer (MBA, 2009). Like other exercises in the program, the experience encouraged students to participate and then reflect upon teamwork and leadership under time constraints, and in unpredictable surroundings. Students in the leadership certificate program WebsterLEADS gathered in Hainburg for Webster Vienna's first-ever 24-hour mini-leadership retreat. Ten freshmen and four upperclassmen senior student leaders attended. Led by the senior leaders and Student Affairs staff, the group worked on team-building, goal-setting, reflection, team-work, and group communication.